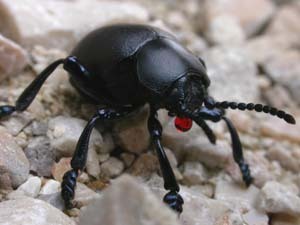 The largest British chrysomelid, known for exuding a drop of red fluid from the mouth when alarmed. Status: Not threatened, though may be declining in eastern midland England. Habitat: Various, mainly open, especially on free-draining soils. Overwintering: Adults can survive for 14 months or more, and so can be found in all months. Other notes: Duller than T. goettingensis with random, dense, tiny punctures. Pronotum constricts more sharply after rounded hind-angles than in T. goettingensis. Oxford, G., Oxford, R. & Warwick, S. (2013). 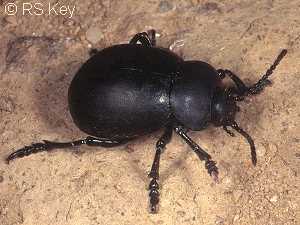 Timarcha tenebricosa (Fabricius) (Chrysomelidae) confirmed in VC 65 north-west Yorkshire. The Coleopterist 22(2): 83.